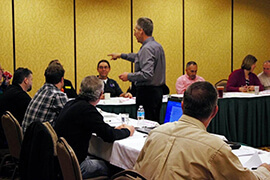 This workshop will demonstrate proven strategy to increase profits in a highly competitive market. Key topics include overcoming common concerns of process inefficiencies, decreasing market share, profit leaks in parts and labor, and customer loyalty. Other concepts addressed by our automotive consultants in this course include: improving staff production, providing 40-plus solid business building marketing strategies, growing profits, and much more. Marketing strategies for both improving customer awareness and loyalty and increasing car count and sales per repair order are also discussed.